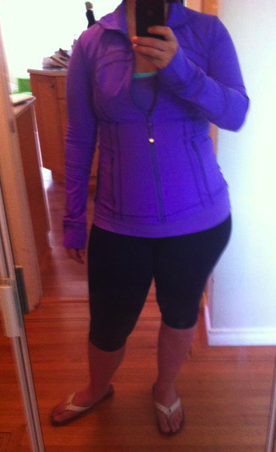 My first Define Jacket in Power Purple just arrived and I am in love with it in this color! I ordered a size 10 (usually I size down to an 8 in Strides/In Strides and some Scuba Hoodies, size 10 in tanks though) and I was quite surprised that the 10 in this was as snug in the lower torso as it was. The length is slightly shorter then I’m used to since I have a long torso, but that being said the 10 is comfortable enough that I’ll probably stick with it in this size. Inspecting it just quickly the seams all look good and the mesh in the back panel is dark purple – I’ll have to look at other Define Jackets to see if it’s sewn in the same way. I also got the Caspian Ziggy XLong CRB and I definitely dislike it. I don’t like how thick the material is. It bunches weirdly and it feels too hot for any sort of workout. The print was also ‘meh!’ for me so I’m not disappointed in sending it back. 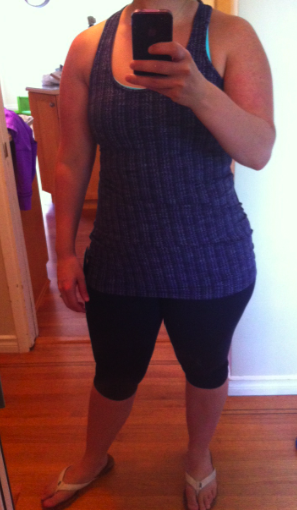 I ended up exchanging my Run: Catch Me Tank for the Angel Blue Energy Bra (peaking thru at the top of my CRB). I like the Run: Catch Me Tank and may end up repurchasing it but it did that weird bunching at the bust so it got eliminated from first rounds. "Ziggy Wee Flare Cool Racerback, Deja Vu, Scarf, Angel Blue Energy Bra, Power Purple Define Jacket"
"The Newest Define Jackets and In Stride Jackets and More"